By Nielsen's figuring, Taiwan based manufacturer HTC is now the third largest smartphone provider in the States. The company has quickly risen from being a contract manufacturer to producing its own popular smartphones for both Android and the Windows Phone platform. But this Wednesday, a decision by the International Trade Commission could have some huge repercussions for both HTC and Android. The ITC is expected to rule on whether some HTC Android models violate patents belonging to Apple. A ruling in favor of the latter could lead to a ban on HTC smartphones in the States where 50% of the company's sales are booked. Back in July, the ITC stunned Android users and HTC fans in particular when it ruled that HTC had infringed on a pair of Apple's patents. HTC appealed the ruling which takes us up to Wednesday's decision. Ironically, the other day the ITC ruled that HTC's products do not infringe on a pair of patents held by former Apple subsidiary FlashPoint Technology related to camera technology. Other defendants like RIM, Nokia and LG settled out of court while HTC rolled the dice and won. 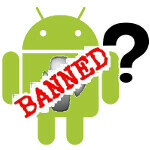 When the ITC made its "initial determination" on July 15th, there was real fear in the air that all Android devices could end up being banned in the States. the ruling needed to be voted on by all 6 members of the commission and it is the result of that vote that we will find out about on Wednesday. As far as a possible ban is concerned, considering that HTC has won initial rulings against Apple for patent infringement, it would behoove the entire industry to work out a settlement as the only ones that benefit from all of this litigation are the attorneys and those nimble fingered court reporters. Wow... Apple needs to loosen up..
how is in the nielsen article it says that htc is the third?? its the first!! We'll see what happens. Bans can be overturned. Phones can be rereleased with software or hardware that works around the infringed upon patents. And Apple had better be very careful what bans it requests. Apple is suing so many manufacturers it seems. Soon no one is going to be willing to make Apple products. Ironic considering how poor quality Android phones tend to be, so which one is the turd now? Being as I had the iPhone first & hated it I went to the Samsung Epic.. Had it for over a year & have no broken it once... They are way more sturdy than iphones that's for sure! What a horrid precedent this would set. All kinds of litigation could drop from the skies if manufacturers believe they could get their competitors removed from the market. Even if the ITC rules in favor of Apple, a real possibility, there is no reason to assume they will automatically ban HTC. The ITC is full of moderately smart people, and they have to now the trap door they would open in the billion dollar mobile industry if they ban products. There is a very good chance that the ITC may just force restitution for the infringement, which is what Apple, HTC, Samsung and all the dozens of other suits should have been shooting for anyways. MS and Google should put an offer into HP to buy the patents they got from Palm then we will see who makes the two major OSes. God dammit Apple, I hope Motorola takes care of you! This is a good thing. People will finally realize that apple is a colt, monopoly, anti-capitalist and most important, we prefer your money than satisfaction company. Can't wait till wp7-8 becomes a threat so apple can poke htc again but fail since bill gates will be defending them. Like Steve said, "thermonuclear." HTC having too many issues with Android. Maybe its time to go full force Wp. its not going to be banned. A person on reddit in r/android found a patient that dates back to the 1980s that basically puts apple's case out to the paster. He has emailed google and HTC, getting replies from high ups in both companies. Down vote me all you will, but apple is going to have a hard time taking android from its nerd/programing community when it tries to lie its way to victory. People on here need to quit freaking out. Let's be realistic. All these companies (Apple, Samsung, HTC etc) are too big to be actually banned from an entire market. Everyone is suing everyone and in the end there will be some settlements and that will be the end of it. Taking good high-demand products out of the hands of the consumers who would certainly have bought them, given the opportunity, is wrong and hurts the consumer. Forcing a company to stop selling their wares to their highest-volume (in this case, majority-volume) market is a kick in the teeth, and a potential death sentence, for that company. I did not like having to see Samsung go through this, and I do not want to see either Apple or HTC go through this either... consumers who have done their research and decided on what they want, and have been waiting for these products to be released in their market, will be highly disappointed and will have to look for alternatives that may not be as viable for their purposes. when a company uses an OS like android that has blatantly copied patents that are found in iOS, then yes they deserved to be ban. I LOVE TO YELL TOO!!! CAP LOCKS FOR THE WIN!!! WHAT? I CAN'T HEAR YOU... YELL LOUDER! @PAULYYD NO ONE COPIED APPLE IF ANYTHING THEY COPIED ANDROID OS ANDROIDS OS WHERE OUT WAY BEFORE THAT DANG IOS SYSTEM ANDROID OS ORIGIONALLY STARTED ON PC'S BEFORE THEY COME TO PHONES! WHY DO PEOPLE STAND IN LINE FOR THOSE PHONES ANYWAYS?